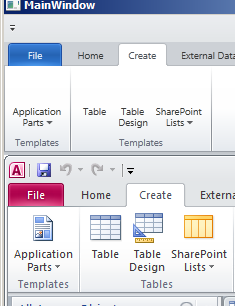 with content, the size of items / text seems to be slightly smaller than the ribbon found in Office. Side by side with an Office 2010 product (Access), it looks like this (I didn't bother putting icons in, but you can still see the difference in text). Is there a setting or property I can change to make my ribbon match Office's text size out of the box? When I run our Sample Browser demos and bring them up next to your screenshot, they look like the bottom Office screenshot and match its font and size. Can you describe your operating system, .NET version, and theme settings? We're not seeing anything like that top screenshot, even in XP. Perhaps you have some other font size settings in your App resources that are affecting things? Or do you have smaller font sizes set in your system font settings? 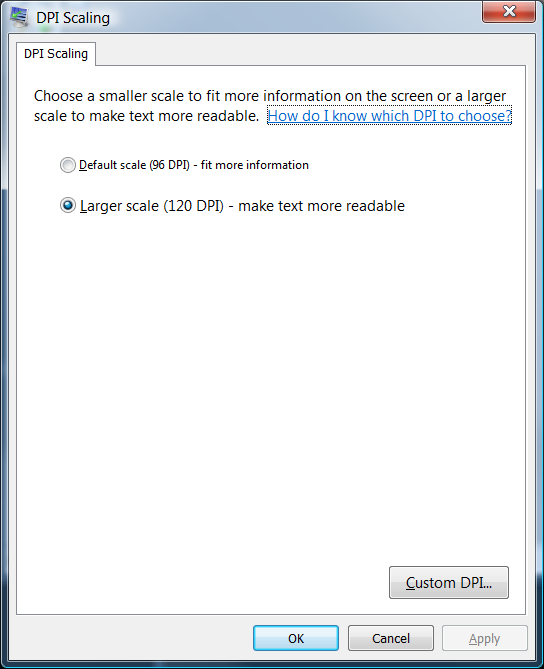 I was able to get the sample app that I posted above to match Office2010 exactly by turning up my DPI settings to 120. Switching between 96 / 120 DPI on my machine scales up the ribbon on both Actipro and Office, but only on the 120 DPI setting do the two ribbons seem to match on my machine. Is there a tool I can run to get you all of the information you need in terms of theme / OS? We have code that kicks in for Vista and Windows 7 that slightly reduces the default font size but on our Win 7 machines the result is the correct Office font size. Question, do you have the "Segoe UI" font on your machine?